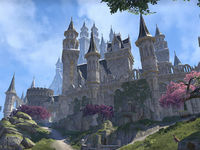 Alinor is a city found in the southwestern part of Summerset. It is the capital of the province and the seat of power of the Proxy Queen Alwinarwe. Culture Clash: Help Rigurt the Brash gain an audience with Summerset's Proxy Queen. A Duelist's Dilemma: Help an Orc prepare for a duel according to the High Elf customs. 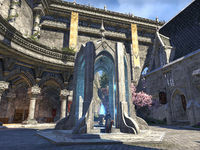 The Alinor Wayshrine is located in the eastern part of the city. Alinor has previously appeared in Arena. "Rinmawen's Plaza" was initially called "Reman's Plaza". This page was last modified on 21 March 2019, at 17:28.